The point of writing Brexit Time and this blog has been to show how time shapes Brexit. From the timing of the referendum and the triggering of Article 50 to the two-year window for negotiating an orderly withdrawal, time has been a factor at key moments in the Brexit process. As we approach 29 March 2019 – the UK’s scheduled date of departure from the EU – the European Council has offered the UK extra time to facilitate an orderly exit from the EU. If MPs approve the deal negotiated between the EU and the UK before 29 March, the EU27 have offered to extend the Article 50 negotiation period to 22 May to allow legislation to be passed in the UK to give legal effect to the Agreement in domestic law. Even if MPs fail to approve a deal – either because an approval motion is proposed and defeated or because the UK Government delays a vote till after 29 March – European leaders have also offered the UK an extension till 12 April. The choice of these dates is clearly to avoid getting the UK mixed up in elections to the European Parliament which neither sides wants. The extension till 22 May is less extra time that Theresa May requested in her letter to European Council President Donald Tusk. Despite knowing that the EU27 did not want an extension into the election period, Theresa May had requested a 30 June deadline. The offer from the European Council underlines the European Commission’s position that a longer extension would pose legal risks in the formation of the new Parliament. So although the EU27 have shown some flexibility it’s not at any price. What is significant about the extension offer is that the original idea of a single deadline of 22 May conditional on MPs approving a deal has been significantly modified by the unconditional offer to extend to 12 April. This is intended to prevent a cliff-edge “No Deal” exit on 29 March. But this offer is also problematic. Firstly, Parliament is scheduled to be in recess from 4-23 April. In Parliamentary terms this only gives one additional week for a “meaningful vote” to be presented to MPs. Secondly, as things now stand “exit day” is defined in UK law as 29 March. An extension beyond that date in terms of Article 50 TEU would keep the UK in the EU as a matter of EU law but without domestic law giving continuing legal effect to membership. The European Union (Withdrawal) Act 2018 allows a Minister to change the exit date by regulation and this would need to be approved by Parliament before the 29 March deadline. If MPs have not approved a deal the exit date would be changed to the 12 April default. If by that extended date the Brexit deal has been approved a further regulation would need to change the exit date to the later 22 May deadline on the assumption that the EU27 would agreed to this extended deadline notwithstanding that the vote had not taken place “next week” (as stipulated in the Conclusions to the European Council meeting). How things play out depends on a couple of key events next week. On Monday the Commons is set to debate a motion triggered under the EU (Withdrawal) Act as a consequence of the Commons’ second rejection of the EU-UK Brexit deal. Although this is a technical motion on how the Government intends to proceed it is also an important moment for MPs to signal how they want the Brexit process to develop. A cross-party Amendment has been proposed that changes the normal rule giving precedence to Government business so that on Wednesday 27 March MPs can move and debate motions other than a Government motion to approve a Brexit deal. The idea behind this is to give MPs control over Parliamentary business with a view to taking control over the process. The second key event would be the Government again asking the Commons to approve the Brexit deal. The offer of an extended Brexit deadline assumes that vote will take place the week beginning 25 March although in theory it could be delayed to the week beginning 1 April. Despite the Commons Speaker’s statement that the Government cannot put substantially the same proposition to the House as the motions previously rejected, the European Council’s formal approval and endorsement of the Brexit deal together with a proposal to lay a draft regulation extending Brexit deadline would likely pass the Bercow test and so allow yet another “meaningful vote” to progress. However following the Prime Minister’s ill-judged berating of the very MPs whose backing she needs it is far from obvious that the deal will be approved. The EU has made clear it is open to making changes to the Political Declaration if there is a majority in the Commons for an alternative Brexit. There are cross-party moves to articulate what that might look like and if the amendment to Monday’s motion is passed m, the Commons could have the opportunity to come to a view. But the issue of free movement of people could make consensus on a Common Market 2.0 vision of the future relationship hard to sell to MPs in Leave-voting constituencies. In the absence of an alternative consensus and in the face of a No Deal Brexit the only option may be to admit failure and requests an Article 50 extension of much longer duration. An extension of a much longer length would suggest a fundamental change in domestic politics is needed to chart a way forward. That could be an early general election or a further referendum. Politics takes place in time but it is also structured by time. Brexit Time is unrelenting. It is also unforgiving. 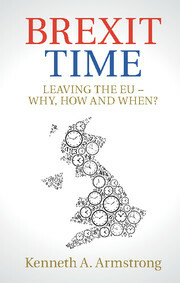 Author Brexit EffectPosted on March 22, 2019 Tags Article 50, Brexit, Brexit Time, European Council, extension, No Deal, parliament, Withdrawal Agreement1 Comment on Extra Time – But for What?